I saw across him across the car park. He was just coming out of the doctor's surgery. He looked handsome, debonair and charming as he always does. My heart fluttered. A thought flashed across my mind that maybe he was being treated for bipolar disorder... quickly followed by the even more worrying thought of erectile dysfunction. But as our paths crossed I was captivated by his sparkling blue eyes, his lean body clothed in a dark grey suit and open necked shirt. His casual elegance. "Hello," he replied, his smile breaking into an enticing grin. "I trust you've not got bi-polar disorder?" I said. "No, indeed," he laughed. "Just a small problem, easily rectified." I glanced down at his pants. He laughed and said something witty. I said something witty in reply. He said something even wittier. I said something even more wittier. "Wow," he said. "Your the funniest woman I've ever met." "So you've not met Graham Norton then?" I quipped. "Hmm. Point taken." He grinned again. "You know, I've never met a woman like you." "Neither have I," I replied. "Which is lucky as otherwise I'd have to share my inheritance." He laughed again and reached out and touched my face. "You have the most amazing eyes," I said as he ran his finger down my cheek. "You have the most amazing...bottom," he said, as his hand strayed to my thigh. "Oh gosh," I replied, my knees shaking. "No one's ever said that to me before!" He slid his arms around my waist. I wrapped my arms around his neck. Yep, Mr T's alarm clock went off. Sod it. Sod it. Sod it. Why do things like that always, always, happen to me? The only time I get a decent dream where I'm not been bashed to death by a lunatic with a Le Crueset saucepan or drowning in a sink of stinky dishwater and it has to be ruined by Mr T's alarm clock. Humph. I'm lodging a formal complaint. I demand some flattery of my bottom or I'm moving out. Appreciation of one's bottom, now that is real appreciation. So what's happened to Arnie then? 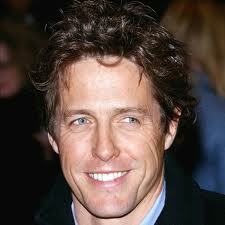 Or perhaps Hugh just has the edge with the twinkle in his eye.